NEW ORLEANS – Welcome to the final month of the NAIA Outdoor Track & Field season. That means it is crunch time and the most recent National Team Rankings, released Wednesday by the U.S. Track & Field and Cross Country Coaches Association (USTFCCCA) certainly reflect that. 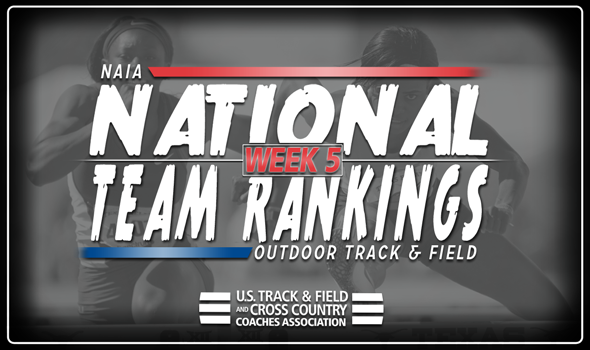 Out of the 50 combined teams in the men’s and women’s rankings, only seven remained in place from Week 4 to Week 5. The 2018 NAIA Outdoor Track & Field Championships will be held May 24-26 in Gulf Shores, Alabama. Indiana Tech and Wiley (Texas) continue to hold down the top-2 spots on the men’s side. In fact, the Warriors and the Wildcats are the only two teams with more than 300 ranking points. Doane (Neb.) jumped three spots to No. 3 following a strong weekend by its jumpers and throwers. Shingai Kusena (triple jump), Zach Brittain (shot put) and Ben Berreckman (shot put and discus) all notched national top-10 marks for the Tigers in their respective events. This is the first time Doane (Neb.) has been ranked in the top-3 since Week 7 of 2016. Wayland Baptist (Texas) vaulted into the top-5 for the first time this season. The Pioneers climbed nine spots between Week 4 and Week 5 after Keiontae Williamson moved into the top-12 nationally in the 800 with his time of 1:53.47. Central Christian (Kan.) rounded out the top-5 this week after it fell two spots. Welcome to the No. 1 spot, Wayland Baptist (Texas)! The Pioneers supplanted Indiana Tech thanks to the efforts of Tiona Owens, who is now ranked ninth nationally in the long jump at 5.85m (19-2½). That is 13 top-10 marks for WBU, which has been ranked No. 1 12 times in program history. There weren’t any other changes to the top-5 outside of that swap. Southern-New Orleans (La.) held its ground at No. 3 and is followed by Hastings (Neb.) at No. 4 and Friends (Kan.) at No. 5.